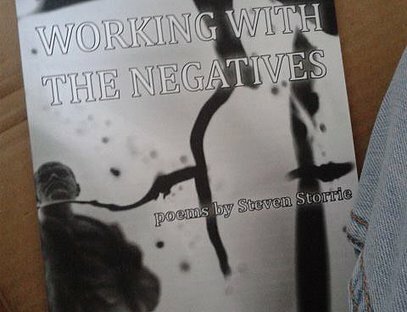 Steven Storrie's first collection of poetry, "Working with the Negatives" (Pski's Porch, 2016) is fifty-one pages of poetry that kept me flapping the pages. It was coincidence that my receipt sat on "Bush Era Tattoos," but a fitting one. I am continually fascinated by reflections on 9/11, perhaps as the previous generation was by the Kennedy assassination. The title plays on developing photographic negatives and the working with the negative aspects society inevitably throws our direction. Storrie, whose bio says he has worked as a cable TV repairman, dishwasher, choreographer, ice cream vendor, and junkyard attendant, could easily have been one of my housemates. The hints at his fatherhood and marriage (“Advice for my Unborn Son” and “Last Exit to Nowhere” in particular) suggest the complexity of the politics and existentialism, or perhaps I am just reading my own fatherhood and marriage into the existentialism and politics that I want to read between Storrie’s lines. Nevertheless, there are poetry collections I appreciate, and poetry collections to which I will return. I take only minor issue with Storrie’s general lack of punctuation. Most often the poems do not suffer from the sparse use of punctuation, but occasionally I found myself distracted by the lack of commas and periods (though all poems end with periods) and the inconsistent capitalization at the beginning of lines. The book’s layout is clean and clear, and the cover is a striking combination of black and white (negatives) collaged, with only a view of a Vladimir Lenin statue clearly recognizable. This is a great collection to leave casually lying around the workplace.